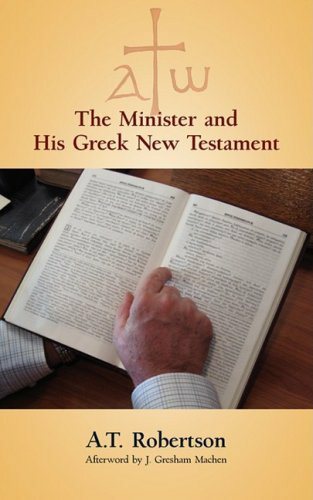 Earlier today I read a great post over at biblioskolex entitled Review: The Minister and His Greek New Testament. 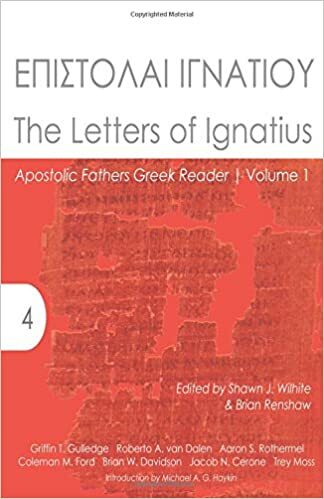 The post, as it suggests, is a review of A. T. Robertson’s The Minister and His Greek New Testament, a collection of essays on the Greek New Testament. I encourage you to click over to the post for more. The post itself reminded me of a constant internal debate I have with myself regarding the modern minister’s relationship to the biblical languages. Naturally, as my focus is in the biblical languages, I am inclined to believe that everyone should and, dare I say, must study what I am interested in. In all seriousness, since the minister is charged with understanding, interpreting, and delivering the word of God to his people, it seems only fitting that he should have a grasp of what the word says in the original languages. And yet, there is another part of me that recognizes that I’m not inclined towards the proper study of ethics or philosophy, both of which have bearing on religion generally and biblical studies particularly. Each of us has our strengths, weaknesses, likes, dislikes, areas of interest and disinterest. Very few are gifted jack of all trades in the study and application of the Bible. God has provided each member of the church—including the minister—with gifts according to the needs of the larger body, and that may or may not include knowledge of the biblical languages. Yet again, should we not expect the ministers—and elders for that matter—to have the ability to offer answers to individuals in the congregation who ask: What does it say in the Greek or Hebrew? Why is this translated in various ways? Why do some translations have only one sentence for these six verses when others have six?If those charged with the task of leading the church cannot provide answers to these questions and speak with confidence from their own studies, who will? Should all ministers be required to know the biblical languages? If so, why? Are there any exceptions? What are they? This entry was posted in Biblical Studies, Greek, Hebrew, NT Greek, Teaching. Bookmark the permalink. Some people love languages. Some people, no matter how hard they try, will struggle with even their native language. None of us can be painted with a broad brush, but each are a creation of God, unique! So we should encourage those that are able to study as they are gifted, without condemning those who find English hard enough, let alone Greek verb endings! Key – Encourage those who can (it is valuable) without condemnation of those without that gift. I just got to climb on my soap box here with my call for better pastoral care and training of our pastors and that we insist that our elders / pastors have pastoral gifting s. It frustrates me no end, when you sit in a bible study or ask a minister a question, or share a personal problem and bible passages are quoted at you – knowledgeable looks and nods given, and a rubbing of the hands given, as if, problem is now solved, and a self congratulatory pat on the back given – with the thought, that fixed that pastoral problem. Climbing off my soap box now 😉 I struggle learning greek, and it’s something I will continue on struggling with. Truth be told, there are times when I don’t have the time to struggle with it, and so other priorities are given. But, what I do like, is being able to read others who are victors in their struggle with it – and discover the nuances of the texts they are working on. One of the qualifications for elders is that they be “able to teach.” Teach what? Sound doctrine from the Bible. Those that teach will “receive a stricter judgment.” How are you going to be sure that you aren’t leading your people astray? Yes, absolutely, every elder should be expected to increase their ability to teach Scripture accurately, and knowledge of Greek and Hebrew is essential to this qualification. I think if a pastor can demonstrate a functional knowledge of the languages, that would be preferred, Ideal? sure, it would be great if they were fluent in them. not sure its possible for all to be fluent but as Robertson suggest, I do think those with a working knowledge will be able to know parts of speech and basic syntax issues to effectively expound the Scriptures.